"When Emily Arsenault was growing up, a teacher told the fifth-grader she was very good at writing. Give that teacher an A." Emily Arsenault's compelling debut, Broken Teaglass, was resoundingly praised ("Quirky and inventive...meets all the definitions of a good read." --Richmond Times-Dispatch). With her intelligent, complex, and ingeniously crafted sophomore offering, In Search of the Rose Notes, Arsenault validates her standing as an exhilarating new voice in contemporary fiction. 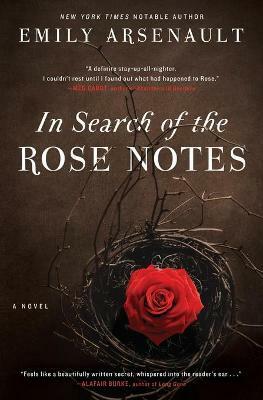 A moody and engrossing mystery, In Search of the Rose Notes follows two best friends from childhood who once unsuccessfully investigated the disappearance of their teenage babysitter, and now, in their twenties, attempt once again to uncover the truth. Readers who love the literary, female focused mysteries of Laura Lippman, Tana French, and Jennifer McMahon will be thrilled to add Emily Arsenault to their must-read lists. Eleven-year-olds Nora and Charlotte were best friends. When their teenage babysitter, Rose, disappeared under mysterious circumstances, the girls decided to "investigate." But their search--aided by paranormal theories and techniques gleaned from old Time-Life books--went nowhere. Years later, Nora, now in her late twenties, is drawn back to her old neighborhood--and to her estranged friend--when Rose's remains are finally discovered. Upset over their earlier failure to solve the possible murder, Charlotte is adamant that they join forces and try again. But Nora was the last known person to see Rose alive, and she's not ready to revisit her troubled adolescence and the events surrounding the disappearance--or face the disturbing secrets that are already beginning to reemerge.